Married Catherine at St. Helen's Church Toronto in 1900. A Toronto Railway conductor, he left the city in 1912, when William was 10, eventually joining his brother Alexander in Chicago where he did manual labour in the building trade. He never remarried. Click on her name for a full description of her wedding day. d.o.d. September 1923 in Toronto of a perforated Gall Bladder. She was 46. Raised by his maternal grandparents. A carpenter, and later a surveyor, and builder, born in Enzie Scotland.Worked his way up to supervising the building of Toronto's Old City Hall, Union Station, Harbord C.I. etc. Daughter of John Chisholm, farmer in Beauly, and Isabella Rhind Chishom. Married William4/22/1865 in Inverness. Likely died a victim of the 1920 Flu epidemic which claimed many of Toronto's elderly. baptised 12/04/1803 d 9/10/1869 b 1812 baptised 4/18/1812 d 2/13/1899 baptised 3/26/1809 d 1881? Acknowledged as father of William Fraser. Harbour Master, fish curer, general merchant, grain dealer and, together with his sisterIsobella, innkeeper of the Portgordon Inn. After birth of her son William Fraser, she married William Simpson 9/14/1841 in Rathven. 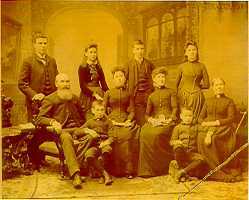 Together they were the parents ofAnn Simpson(b8/27/1842)who married Ed McGee, Mary Simpson (b11/8/1844) who married Traynor, Isobella Simpson(b2/26/1847) who maried Ferguson, and Alexander Simpson (b.7/6/1853 d 1935) who married Jane Forsythe (1858-1908) Before his marriage to Ann Green, he was married to Isabel Reid (10/22/1836) )and was father of James Simpson(b 1/22/1838). Isabel died around 1840. He was a blacksmith in Longhill. dob 10/30/1742? Married Isabella 4/19/1772 in Bellie dob 1750?